Sanders won in almost every demographic. Voters in Nevada and South Carolina will decide next. 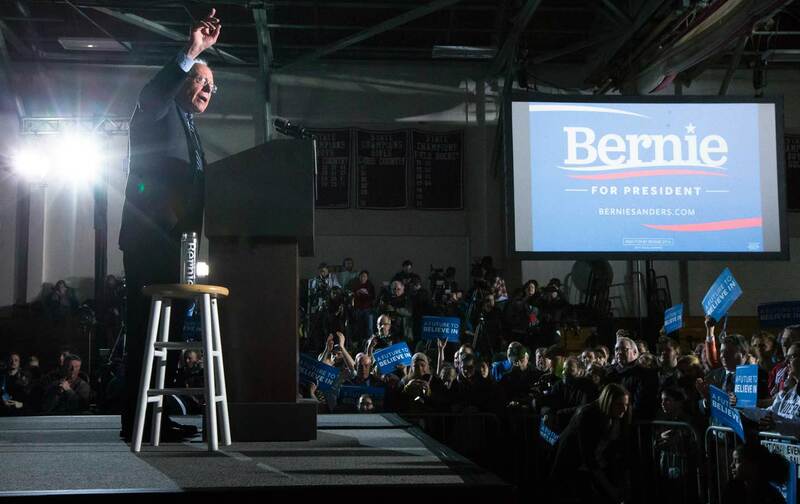 Concord, New Hampshire—So this is what winning feels like. Mounting the stage to cheers of “We don’t need no Super PAC! Bernie Sanders got our back!,” the first socialist candidate in American history to win a primary was in no mood to downplay the significance of that victory. “We have sent a message that will echo from Wall Street to Washington, from Maine to California,” Sanders told his supporters. “We have harnessed the energy and the excitement that the Democratic Party will need to win in November.” Defying pundits who pronounced his quest for a political revolution an impossibility, and pollsters who, in recent days, claimed his lead in the state was shrinking, Sanders won a decisive victory, defeating the most formidable machine in American politics by more than 20 percent. As the scale of her defeat became clear, Clinton’s staffers were reportedly analyzing the exit polls for any signs of hope, only to find that Sanders led among almost every demographic—younger voters, liberals, white men, and even women. His lead among working-class voters was particularly pronounced—a trend that was suggested by the Iowa results, and a stunning reversal of fortune for Clinton since 2008, when she, not President Obama, was seen as the standard bearer for lower-income whites. “There is no secret formula to winning in New Hampshire,” Julia Barnes, the Sanders campaign’s state chair, told me this summer. Sanders supporters would simply have to knock on more doors, make more phone calls, and reach more potential voters than the opposition. Looking around at the ecstatic crowd who packed the Concord High School gymnasium tonight, I could see the fruits of all that hard work—much of which went unnoticed by national media who mistakenly awarded the state to Sanders on the ground that Vermont was next door (ignoring a history of antipathy that began with open warfare in the 18th century and continues to this day) and at the same time seemed to discount Sanders’s victory even before it was declared. Geography had nothing to do with it, Martha Rheaume told me. A disability supervisor, Rheaume, 62, was wearing a shirt that identified her as a graduate of Camp Bernie—a day-long training session “teaching us how to canvass, how to work a phone bank, how to organize.” Rheaume was one of a dozen older women I spoke with who said they were supporting Sanders because of his policies—and his honesty. Karen Rakhshan, 54, from Hood River, Oregon, who took the night off from visiting her daughter to attend the victory rally, said it was “the Super PAC situation” that turned her against Clinton. “I don’t trust her. She owes too many favors,” said Rakhshan. “They threw everything they could at Bernie and they couldn’t stop his momentum,” said Chamberlain. How far can that momentum take Sanders? It’s true that the next stage of the electoral calendar should favor Clinton, who has garnered some key union endorsements in Nevada and is counting on rock-solid support from African-American voters in South Carolina. But both campaigns have enough funds to carry on past Super Tuesday—at which point the terrain shifts yet again, to states like Michigan, Florida, Illinois, and North Carolina, where the match-up between Sanders’s “political revolution” and Clinton’s “progressive who gets things done” is a lot harder to predict. This is a long way from over. But whatever happens next, those of us who were lucky enough to be there will never forget what tonight felt like. Is hope contagious? We are about to find out.